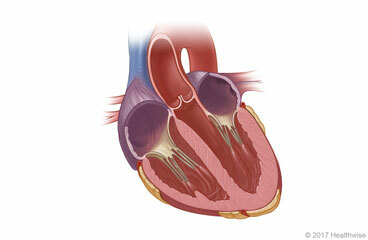 A congenital heart defect is a problem with how a child's heart formed. The doctor fixed your child's heart defect by putting a thin tube, called a catheter, into the heart through a blood vessel. This is most often put through a blood vessel in the groin. Your child may have a bruise or a small lump where the catheter was put in his or her groin (the catheter site). The area may feel sore for a day or two after the procedure. Your child may need more sleep than usual for a few days. This procedure can be stressful for you and your child. Your child's recovery will depend on the type of heart defect he or she had. Your child may need more than one procedure or surgery to fix the problem. He or she may need to take medicines and see a heart doctor throughout life. But many children lead a normal, active life after the defect is fixed. This care sheet gives you a general idea about how long it will take for your child to recover. But each person recovers at a different pace. Following the steps below can help your child recover as quickly as possible. Your child's doctor also will give you care instructions. Have your child rest when he or she feels tired. Allow the area to heal. Don't let your child move quickly or lift anything heavy until he or she is feeling better. Your child should not ride a bike, play running games or contact sports, or take part in gym class until your doctor says it is okay. It is okay for your child to walk and play with other children or play with toys. Until your doctor says it is okay, your child should not do activities that could cause a blow to the chest, such as wrestling or playing catch with a ball. Your child may shower 24 to 48 hours after surgery, if the doctor okays it. Pat the incision dry. Your child should not take a bath for 1 week, or until the doctor tells you it is okay. Your doctor will tell you when your child can go back to school or daycare. Your child will probably have to spend at least 1 day at home. For about 1 week, keep your child away from large crowds and people that you know have a cold or the flu. This lowers your child's chance of getting an infection. Your child can eat a normal diet. If your child's stomach is upset, try bland, low-fat foods like plain rice, broiled chicken, toast, and yogurt. If your child's bowel movements are not regular right after surgery, you can help him or her to avoid constipation and straining. Have your child drink plenty of water. The doctor may suggest fibre, a stool softener, or a mild laxative. If your doctor prescribed antibiotics, be sure your child takes them as directed. Your child should not stop taking them just because he or she feels better. Your child needs to take all the antibiotics. If your child takes a blood thinner, be sure to get instructions about how to take this medicine safely. Blood thinners can cause serious bleeding problems. Your child will have a dressing over the site where the catheter was put in. A dressing helps the incision heal and protects it. Your doctor will tell you how to take care of this. Put ice or a cold pack on the site for 10 to 20 minutes at a time. Try to do this every 1 to 2 hours for the next 3 days (when your child is awake) or until the swelling goes down. Put a thin cloth between the ice and your child's skin. Follow-up care is a key part of your child's treatment and safety. Be sure to make and go to all appointments, and call your doctor if your child is having problems. It's also a good idea to know your child's test results and keep a list of the medicines your child takes. Your child is bleeding a lot from the catheter site. Your child is dizzy or light-headed. Your child has severe pain in his or her groin or leg where the catheter was put in, or the area becomes cold, pale, blue, tingly, or numb. Your child's groin is very swollen and there is a lump that is getting bigger under your child's skin at the catheter site. Your child is sick to his or her stomach or cannot keep fluids down. Your child has pain that does not go away after you give him or her pain medicine. Enter S578 in the search box to learn more about "Cardiac Catheterization to Repair a Congenital Heart Defect in Children: What to Expect at Home".